4. Does Work Order Plus support …? (Figure 2) Most of the maintenance options can be found under Maintenance. Before exploring Work Order Plus, several things need to be configured. Account numbers need to be added, the control setup flags need to be reviewed, the basic shop related tables need to be built and your own routing for each manufactured item needs to be created. If you would like to separate scrap cost from production cost. In Work Order Plus, there are plenty of controls to fine-tune for different needs. They are separated into BOMP Global Control and BOMP Setup screens. 13. Outside Process Absorbed Account. Enter if your manufacturing scheme includes an outside process step. 14. Default Labor Absorbed Account. This will be the default account number. You still can assign account numbers work center by work center. 15. Default Burden Absorbed Account. Similar to the previous setting. It is a default account and can be overridden work center by work center. Next, you need to set up several shop related tables. In minimum, you need Labor Grade and Work Center. You can configure Department to get the benefit of analysis and management. 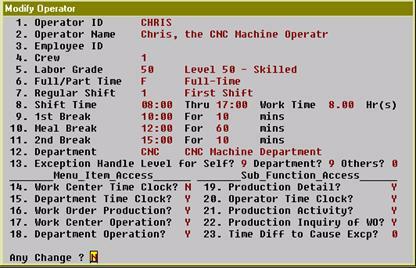 The Operator file is needed to fully benefit from the WO+ time-clock system. In Labor Grade, you can set different hourly rates for different levels of labor. This rate is the basis of calculation for labor cost. You may want to set the rate a little higher than the average rate for that level to consider the extra burden of insurance, benefits, bonuses, etc. In Work Center Maintenance, you can define different work centers in your shop. A work center can be regarded as a single machine or multiple machines which share similar attributes, like a workbench, the shipping area, a CNC machine or an assembly line. Several fields need to be set in this table. It is possible to set different absorb accounts for different work centers. This will default to the account in the Department file or the BOM global setup. Default level of workers who work in this work center. This will be used as an evaluation standard. If each group/crew operates one machine, a machine-hour should be the same as a man-hour (option “M”). If each member in the group/crew operates one machine, a machine-hour should be set to crew-hours (option “C”). If this work center is like a CNC machine, which does not always require an operator, then a machine-hour should be calculated separately from an operator’s labor hours (option “S”). These parameters allow you to set up burden driven by different reasons when a machine is operating normally or when a machine is in setup mode. You can compare the overhead amount each month with time information, like labor dollar amount of that month, labor hours or machine hours, etc. In the beginning, you can give them a reasonable guess. Over time, you may have a better idea how to set them more precisely. You can use Departments the same way you define departments in your company, but this table is optional. To fully facilitate scanning process for reporting in WO+, you need to define Operator ID. Each Operator ID can represent an individual or a working group/crew. The system will use the hour that one operator spent on a production and his/her labor grade to calculate labor cost. Also, an operator ID is a unit in WO+ time clock/card system and it is possible to evaluate performance operator by operator. Fields 1 to 12 are basic information fields. Field 13 defines what level of exception this operator can handle (0 is least and 9 means all). Fields 14 to 16 define which kind of time clock screen this operator can access. Generally, you can set these fields to “Y” with no harm. Fields 17 to 22 define which screens an operator can access. These fields should be set to “Y” for a supervisor or manager and to “N” for lower level workers. You can also use F2 to copy the highlighted operator profile to another. Notice that this table is optional if you choose to enter all the labor and machine hour information of a production order manually. After configuring the shop environment, you would need to define the Bill of Material and Routing for each of your products. To configure the bill of material for a product, you need to add a structure through Product Structure file. You can add multiple items as components to one parent item. Also, it is possible to preset the operation number when this component will be used during the production through “5. Attaching Operatn”. Due to Macola’s original implementation, each product can only have ONE set of bill of material in Product Structure. However, it is possible to override the bill of material during the order entry. If you want to have multiple pre-set bills of material and routings, WO+ also provides a Base Work Order. This solution will be described later. Next, you need to enter the routing of your product through Product Routing Maintenance. You can define multiple steps for your manufactured routing of one product. Also, you can have multiple routings for one product. If multiple products share similar routings, it is possible to copy routing from another product when entering the routing number. If security of your Elliott account allows, this screen will show the estimated cost of each operation. Material will be attached to the operation based on the setting in Product Structure and BOMP Global Setup. 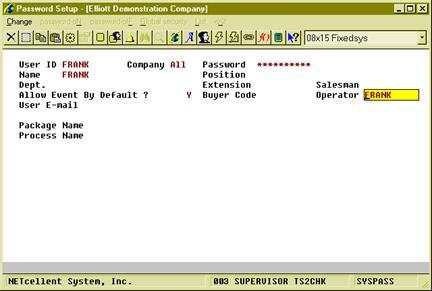 Operation ID (optional) – This is another table which can help you to manage operation data, but it can be blank. Operation Type – This has 5 options: Setup, Inspection, Productive, Move and Outside Process. WO+ has special logic for Setup and Outside Process operations. Ex. Setup operation can be skipped when reporting and cannot be the last operation in the routing while the Outside Process operation has extra outside process cost. Qty per Batch – This is for evaluations. If this is set to 10, processing 15 pieces will be considered as 2 batched. If it is set to zero, it means no batch involved (or 1 piece per batch). Machine Operation – This indicates which mode the machine is operating for this operation, running or setup mode. 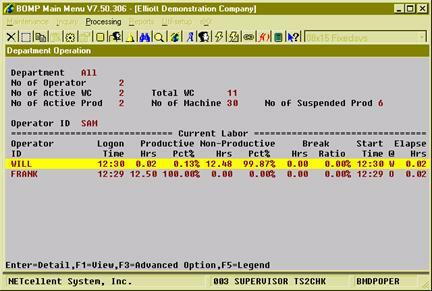 If the machine is in running mode, the system will use Normal Burden in the work center to calculate burden. Otherwise, the system will use Burden in Setup Mode. Outside Process Extra Fields – Only required if operation type is “O” for Outside Process. Provide default values for operations. A method to mass update all routings yet implemented. Although this is an optional table, we highly recommend you to set it up for future maintenance. There are several optional tables that can be configured, including Special Operation and Shift. In WO+, every activity is encoded as an operation number and each production step has an operation number. For those non-production related activities, you can use Special Operation, ex. break, meeting or equipment maintenance. Numbers 0 to 8999 are reserved for routing operations while 9000 to 9999 are for special operations. Among the range of special operations, 9000 to 9499 are reserved for system pre-defined operations, like default break, meal break and logoff. The system will create these records automatically. You can define your own special operations from 9500 to 9999. This can be considered as a replacement for Indirect Code in Labor Performance. If you want to evaluate operators from different shifts, you can define Shift IDs. Each shift can have a default daily schedule as well as the premium rate for this shift. This premium rate will be a modifier for the operator’s labor rate. The formula is: actual labor rate = labor rate * (100 + premium % of base rate) / 100 + premium rate per hour. Production orders can be placed in various ways: manual entry, based on a sales order, based on a production order template (Base Order) or through Availability-to-Promise processing. The most basic way to place an order is through Production Order Entry. Item No – In this field you can enter an item number, create an order based on a sales order or use a base order as a template. Unit Cost/Detail – This field will pop up a routing maintenance screen where you can choose a product routing, modify operation detail and customize bill of material. An estimated unit cost will be calculated based on the final routing for this order. If you want to modify the order routing at a later time, you would need to choose this field. Allocate Inventory – Making this flag “Y” will allocate components for this order. Exact Qty – Setting this flag to “Y” means when this order is completed or closed the system would expect the quantity of the finished parent item to match or exceed the order quantity. Otherwise, the system will consider it an exception. If you find repeatedly entering similar orders is troublesome and most of your work orders are generally based on a few formulas, you might find it useful to define a few Base Work Orders for your products. 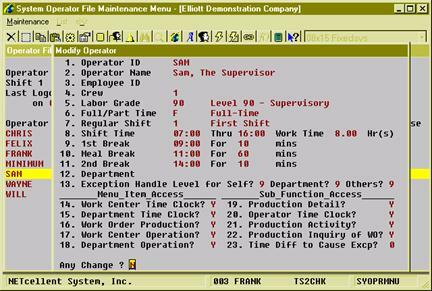 The maintenance screen is similar to the plus work order entry screen. Base orders provide a default value for work orders, ex. Location, Job No and flags, and allow the user to create multiple sets of routing and bill of material combinations. You can choose one base order to copy from when you enter a new plus work order, but this feature is optional. Base orders are not required to use WO+. You may want to create a work order when your salesman places a sales order for your customer and some of the line items are manufactured items. 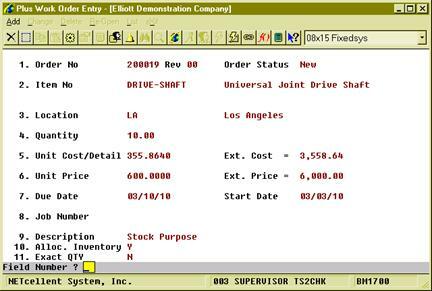 One way to create an order based on a sales order is through Production Order Entry, as describe before. Another way is through Batch Copy COP Orders into BOMP. This allows you to create multiple work orders based on sales orders based on a cut-off date. If a work order is linked to a sales order, it is possible to drill down to the work order through sales order inquiry, and vice versa. You can also create, delete, allocate, de-allocate, modify and print work orders through ATP Processing. Generally, if all the basic tables are set up properly, you may find placing work orders a relatively less painful job than in Shop Floor Control. After your orders have been placed and the production start date is approaching, you will need to release the order to the shop operators. WO+ provides two documents for shop operators: Traveler and Pick List. Through Printing these Documents, the order will be considered released. The first document, Traveler, lists all operation information of the work order. This shows the operator what operation to do next, how many pieces need to be processed and how many hours are expected on each operation. This document may travel throughout the shop, thus the name Traveler. Moreover, it is capable of printing a barcode of the order number and operation number. This means the operators can enter these values with a scanner instead of typing them during the production reporting, reducing the data entry burden. Compared to Shop Floor Control, the traveler is similar to the Shop Packet. The Pick List prints all the components of the work order so the operator can use it to collect the components needed from the warehouse. 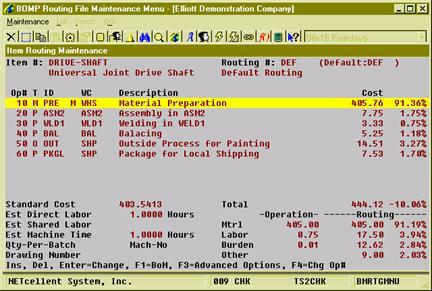 This document functions similar to Material Pick List in Shop Floor Control. After these two documents are printed, the order status will be marked as “Printed”, a.k.a. “released.” If you want to print a duplicate copy of each document, choose Print Duplicate Work Order. Barcode scanning is a powerful and easy data entry solution. Instead of typing letter-by-letter, you can input multiple characters like an Operator ID, Product Number or Order Number through a single scan of a barcode. This makes data entry quicker and more accurate improving productivity. WO+ has many scanning-friendly interfaces for data collection as well as some simple ways to create a barcode through the print programs. A simple wedge scanner is needed to benefit from this enhancement. We use a Symbol Cobra LS 2208 Laser Scanner in-house. It requires a USB interface and is utilized for testing and our live system. You can use any other scanner suitable for your business and able to decode the barcode you created. There are many barcode symbologies. One of the most commonly used is Code 128, which can encode 128 characters into one high-density barcode. You can choose a different symbology as long as your scanner can support it. There are several fields you may want to barcode in WO+: Operator ID, Order Number, Routing Operation Number and Special Operation Number. 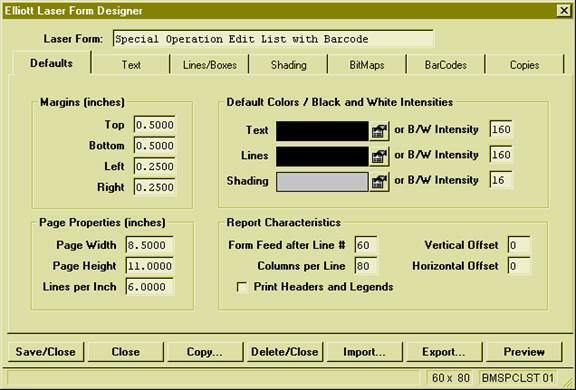 There are several barcode print applications like Bartender, which allow you to edit your own layout and batch create barcodes. 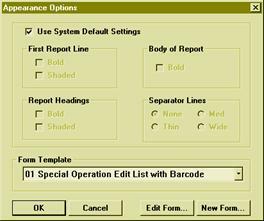 There are some font-based solutions which require an application like Excel or Word to create the barcode. You could find a free online barcode generator. In Elliott, you can select Form Template while printing a report and add a new form or import a pre-defined form template, which you can find under $Elliott_Directory$\forms. Use BMSPCLST.F01 for the special operation edit list, BM20P3.F01 for Pick List, and BM20P3T.F01 and BM20P3T.F02 for Traveler. Select one form before printing and the barcode will be printed along with the report. The following figures show how to select a form template in Figure 8 and how to import a form template in Figure 9. Notice that to create a badge for an Operator, it is slightly different from the others. The badge is the combination of Operator ID and Password so the operator can enter both in one scan. Therefore, you need to concatenate Operator ID (10 characters) and Password (30 characters) into one string (40 characters). Use this string to create the barcode. You may have a traveler with barcodes of the order number and operation numbers, a special operation list with barcodes and some badges with operation ID barcodes. During the production of a work order, information should be gathered to calculate the production cost. This includes Labor and Machine Hours and number of pieces completed or scrapped in each step of production. The operator should report additional information, like components used in each step, extra cost, like freight, to perform and outside process, and so on. Hourly information can be used to calculate labor cost and burden, as well as to evaluate the operator’s productivity. Quantity information can be used to update inventory and evaluate assets and scrap rate of one or more similar products. Traditionally, operators fill out different kinds of forms during the production to gather necessary information and then it is calculated by manually entering it into the system or even calculated manually. These processes are time-consuming and prone to human error. To address these issues, WO+ creates an environment which requires minimum data entry yet sufficient to generate useful information. Our solution is to use a time clock system to collect all the information. We used the restaurant environment as our model: a server takes an order from a customer and walks to the computer, swipes his/her badge and then enters the order into the computer. Similarly in WO+, all an operator needs to report to the system is what has been finished and what is going to be performed. All the hourly information will be collected automatically and used to calculate production cost. Furthermore, each activity is encoded into an Operation Number, either routing operation or special operation, so an operator can use barcode scanning to accelerate the reporting process. Since paperwork is avoided and data entry is reduced, productivity is improved and more accurate production information is gathered for future analysis. Enter the Operator ID and password by scanning a badge or manually typing it in. Report the next job. The job can be for starting an order, reporting current production, taking a break, logging off, etc. Report how many pieces have been completed for a current order. This interface is designed for an entry operator, like a foreman who has a Traveler in hand and understands which order to work on next. This kind of labor is called Direct Labor in WO+, which means the operator performing the labor is directly taking charge of the order and the reporting. After an operator finishes all the work of an operation and reports the complete quantity, a production transaction record will be created. An operator can choose to post transactions immediately or post it later in a batch. The posting process updates the quantities and G/L distributions will be created. Normally a foreman would hold the Traveler and take charge of the production flow. Other workers may work in one place for a long time and handle whatever the foreman asks them to do, like on an assembly line. They may not know which order they are working on, but their labor would be shared on that order. Another example would be the person who takes cares of multiple CNC machines and monitors them at the same time. For these kinds of workers Work Order Production may not be suitable for them, therefore WO+ provides two interfaces: Work Center Time Clock and Department Time Clock. These two interfaces allow operators to sign into one location and their time will be implicitly contributed to any order taking place at that location. Their labor will be counted as Shared Labor for the order. For example, if an operator is taking care of every machine in a department and two orders are being processed in this department, the work of the operator will be split into two and shared to each order. Therefore, WO+ labor is separated into Direct Labor and Shared Labor for an order. WO+ also provides another Time Clock interface for people who are not involved in production, like managers and office employees. Their time information can be used for payroll in the future (yet implemented). A computer with this interface can be placed at the company’s front door for everyone to sign in and out the system. WO+ has one interface for a general purpose time clock. You may want to assign each operator to use one or two of these interfaces at a time. WO+ also provides a manual way to enter production transactions. You can find the transaction edit list function in the same screen. 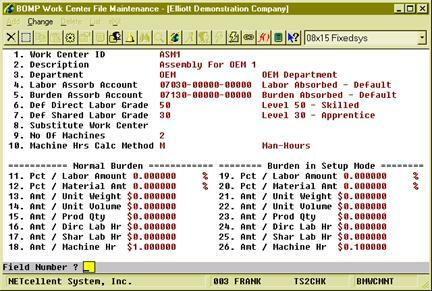 Work Center Operation/Inquiry – Shows the unfinished, complete, and cancelled productions, current operator and activity history in a work center. This screen will update in real-time when the cursor is moved. Department Operation/Inquiry – Shows the current operators and the status of active work centers or all work centers in a department. 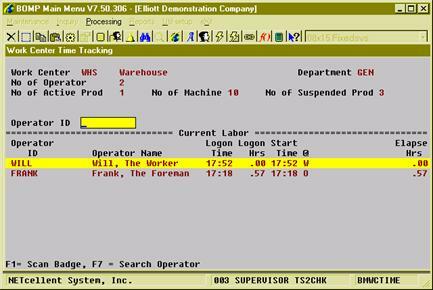 You can monitor all work centers in the shop if the department field is left blank. This screen will update in real-time when the cursor is moved. Work Order Inquiry – Shows general routing and bill of material information of an order. This screen will not include information from an unfinished production and updates only upon the entrance of this screen. Production Inquiry for Work Order – Shows real-time production information of a work order. This includes operation progress, operators who contribute to the order and all the production about the order. This screen will update in real-time when the cursor is moved. 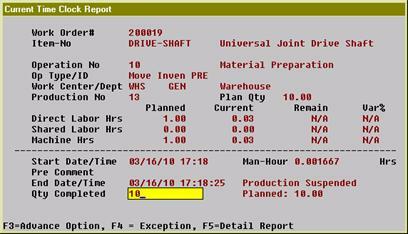 Production Inquiry for Operation – Shows detail production information of an operation in the order, like labor and all the production for the operation. This screen will update in real-time when the cursor is moved. Production Activity Maintenance/Inquiry – Shows the activity details of one production. Note that in WO+, “production” is a unit of transaction before the transaction is created. One operation can take multiple productions to complete, just like it can have multiple transactions, and each production can take multiple times to finish. For example, an operator starts a production, goes to lunch and comes back to finish it. This screen shows the detail activities of each production. Generally there should be only one activity, but that may vary for different situations. Production Detail Maintenance/Inquiry – Shows production detail, like order number, item number, operation number, reported quantity, etc. If this production is a Batch Production, it will show all the orders in this batch. Operator Maintenance/Inquiry – Lists all the operators in the system and displays the current status of each operator. This is the same screen to maintain operator ID’s, is able to see operator detail setup and is able to drill down to the operator time clock screen. Operator Time Clock Maintenance/Inquiry – Shows the sessions and session detail history. A session is a period of time after login and before logoff. Since a meal break is a kind of logoff in WO+, normally each operator should have 2 sessions each day: before meal break and before the end of the day. Each session would have multiple details, like working on an order, taking a break, a meeting, assembling in a work center, etc. Some of the screens are not only for inquiry and monitoring, but also allow the user to manipulate some data, such as the operator time clock. You can find the maintenance function in the bottom line message, advanced option or in the exception handle options. Functions and information can be restricted as defined in the operator file and in Global Security of password setup. In addition to edit lists, WO+ provides many reports for planning, scheduling, analysis and evaluation. Production Schedule Report – This report can print out all uncompleted orders and sort them up by date, item number or work center. This report can give managers a general idea of how many pieces need to be produced and how many hours need to be spent on the production. Work Center Rough Cut Report – This report gives a general estimation of work center capacity and shows it period by period. The period can be by daily, weekly, bi-weekly or monthly. Therefore, it provides a good way to spot which work center is out of resources (labor or machine hours) in that period of time. Managers can rearrange the orders start date or reassign work center for these orders. This report can also be exported to a CSV file for advanced analyzing. Production History Report – This report will list all posted production transactions. Plus, it can show the cost detail break-down information. B/M Distribution Report – This is a standard distribution report for BOMP transactions. Work In Process Report – This report shows where the dollar amount in the WIP Account comes from. The summary report prints order by order while the detail report will break down into operations for each order. Cannot distribute WIP to Finished Goods, ex. report zero for the completion quantity for the last operation when the order is complete. For disassembly, all labor and burden costs go to WIP Variance. Also, the difference between the sum of component costs and the parent item goes to WIP Variance for disassembly. Exception Report – Inevitably, exceptions will happen in the shop. An operator may forget to logoff or report the wrong quantity. In these cases, the manager is able to modify some records to fix these problems. When the modification happens, an exception record will be created. This report allows users to list all exceptions for a particular period of time. Labor Performance Report – This report shows the percentage of productive hours and non-productive hours for each operator and the ratio of break time and total work hours. Through this report you can determine if operators spend too much time on non-productive activities. Production Hour Variance Report – There is always a variance between expectation and reality. This report shows the hour variance for all productions. This can also be used to evaluate the efficiency of each operator since operators can spend plenty of time in productive activities inefficiently. Production Cost Variance Report – This report evaluates the cost variance for completed work orders. It can be sorted by item, product category, customer or job and is able to be printed in different levels. 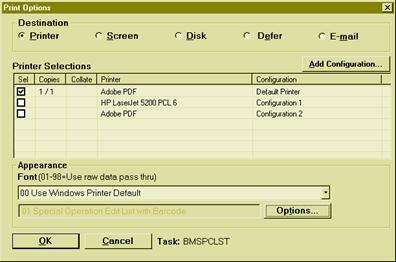 Print Costed Bill of Material – This function allows users to roll-up the standard cost of products based on their default routing and bill of material. Netcellent should be contacted if you receive a Btrieve Error for other databases. There are 3 flags that control whether cost information can be shown. b) “See Item Cost Information” in Password Setup. This controls which Elliott user can see material cost information. c) “Allow User to See Labor Hourly Rate in BOMP” in Password Setup. 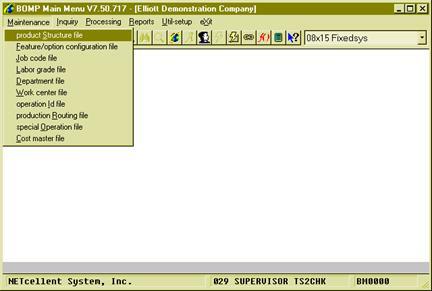 This controls which Elliott user can see labor cost or burden cost. Please check these three flags for your system and users. Only if all three flags are “Y” can a user to view total cost of the production. Information a user can drill down to or what information can be viewed by a user is defined in the Operator File. Fields 17 to 22 in operator setup are for this purpose. In some situations, the system cannot know which operator is trying to drill down to certain screens, ex., drilling down from ATP Inquiry or Sales Order Inquiry. Since the system does not prompt for an Operator ID and password in these cases, it will rely on one field in Password Setup: Operator ID. This field links the Elliott user to an operator ID and integrates the security rules together. Therefore, assign a proper ID for different Elliott users. So you may have the minimum access for a computer in the shop and the maximum user power of a supervisor. If you find yourself unable to drill down to some screens, you may need to check this field as well as the operator setup. Serial Numbers – supported, for both parent and component. Lot Numbers – supported. However, it would take another process to report a lot number for components. Also, cases where the parent lot number is the same as the component lot number are not fully supported. Batch Production is a production to process multiple order operations in the same batch.